A local family is outraged that school officials forced their son to remove a symbol of his enlistment before crossing the stage at his high school graduation. 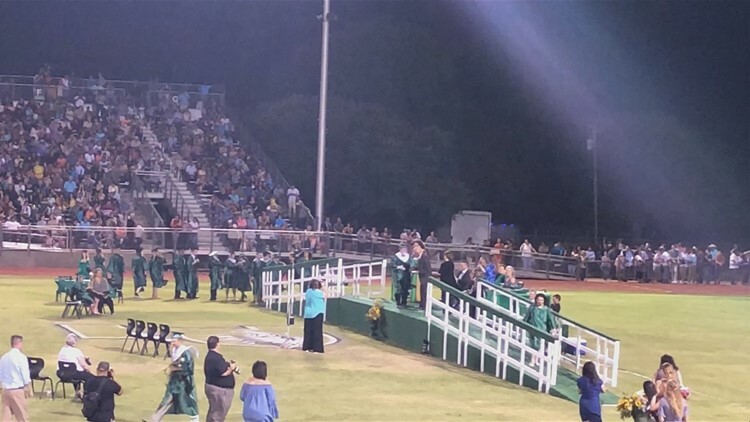 PLEASANTON, Texas -- A student preparing to serve his country and display his patriotic pride during graduation was suddenly scorned by the school. Luc Montelaro says the Pleasanton High School principal told him he had to remove a military sash gifted to him by his Marine Corps recruiter or he could not cross the stage. The last-minute decision on graduation day angered his parents, who say it's a very public display of a son's commitment to serve. But school officials say high school graduation should be about what the students have accomplished, not what they plan to pursue in the future. Montelaro enlisted in the Marine Corps in June 2017, a commitment he wanted to represent at graduation, a once-in-a-lifetime milestone. "My recruiter gifted me and my fellow a sash to wear during graduation that said 'United States Marine Corps' on it, to signify our enlistment," Montelaro said. He says the sash was gifted to him during a school academic award ceremony in front of school staff members, at least two weeks before graduation. “We also wore them during our senior cap and gown panorama photo and no one said anything or told us anything about them,” Montelaro said. He said less than an hour before he was set to cross the stage the principal told him he had to remove the sash, leaving his family confused and upset. "When these students go into any branch of the military, they are going into to fight for our freedoms, you know they could possibly make the ultimate sacrifice and, God willing they don't, but they should be recognized for the commitment they are about to be making," Michael O'Neal, Monteralo's stepfather said. We are very proud of all of our students. And PISD wants to honor our students that enlist in the United States armed forces. We will certainly examine and change any and all practices that do not honor our students and their commitment. Especially if these commitments are to the safety and security to defend our country. I want to personally apologize to these students and their parents. We do not ever want to disrespect or dishonor them. Montelaro says it’s just unfortunate school officials didn’t address the problem before graduation day. "It's not like they are going to redo graduation all over again, so it's nothing that can really be corrected, besides making sure that it doesn't happen to anybody else," Montelaro said. He is set to leave for boot camp in two weeks.